Happy New Year, my friends! It’s always exciting to leave the previous year behind and start a new one. Actually, I feel this way each time the seasons change, but an excuse to recharge and restart is welcome, no matter how often it occurs. And, the transition from 2014 to 2015 is certainly the most “official” opportunity. Welcoming the new year is also the perfect time to celebrate with friends. 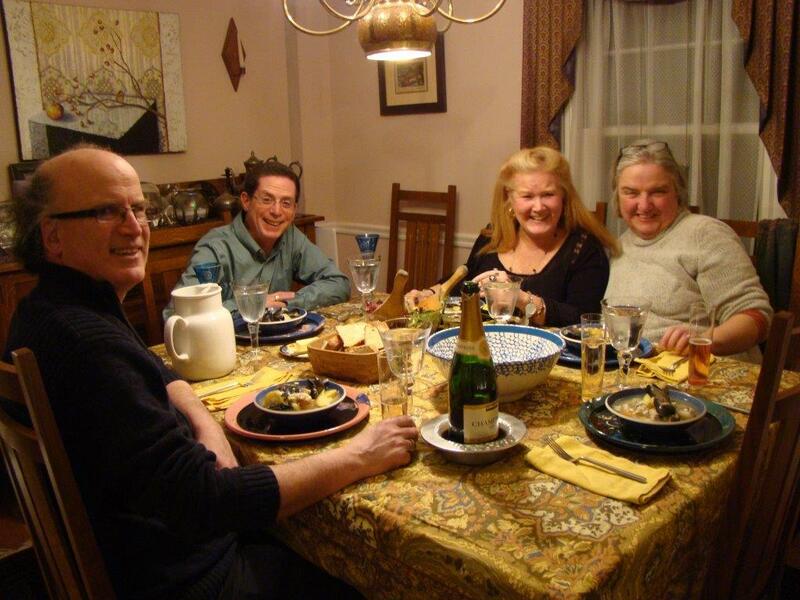 Howard and I hosted a small gathering of a few friends for a New Year’s Eve dinner. We popped open the bubbly right away. Our friends (and best neighbors ever) Cass and Mark brought some Chambord along with champagne for some raspberry cocktails to start us off. We enjoyed our libations with a variety of freshly shucked oysters, some cheese and crackers, and two different offerings of caviar. My friend Laury topped slices of cucumbers with salmon roe along with sliced hard-boiled egg or dill-flecked cream cheese, in the Scandinavian way. I also prepared aspic with caviar, but you’ll have to wait until next week to hear more about that one. Happy New Year from my table to yours! At the center of the menu, we featured this week’s recipe for French Fridays with Dorie, Simplest Breton Fish Soup accompanied by my 2014 favorite, No-Knead Bread, and a beet, walnut, and Gorgonzola salad prepared by Laury. Because this is a brothy soup, I tried my hand at making homemade fish stock. I went to Whole Foods where I’ve seen them filleting fish at the fish counter to see if I could buy some bones. It turns out that they stock the freezer case with bags of fish heads and bones for just 99¢ a pound. I bought the 5-pound frame of a red snapper and made a double batch of stock. Once you’ve procured the bones, making fish stock is a snap. You sauté aromatic vegetables in some butter, then add the fish bones and water and simmer for just 20 minutes. Strain the solids out of the pot and you now have several quarts of gently pure fish flavor. The bones really add substance to the stock because, once chilled, it’s a big gelatinous blob. Fortunately it melts back to liquid as soon as it heats up. The fish soup itself starts with more aromatic vegetables, including leeks, shallots, onions, celery, and garlic, diced up and sautéed in butter. The stock is added and simmers for a few minutes before adding sliced potatoes. I also threw in a few thickly sliced carrots for extra color. Once the potatoes are partially cooked, bite-sized chunks of fish area added. I used mostly cod with a little oily bluefish for some variety. At the very end, mussels are simmered until they open up. I was confused by the recipe description which called for serving the fish, mussels and potatoes on a plate, served with the vinaigrette, with the broth in a separate bowl. I just ladled the soup in bowls, no separating of ingredients. I passed the vinaigrette around the table, and everyone tried it, but I think we preferred the soup without it. I’ve saved the leftover vinaigrette to use on salad. My only quibble with the recipe is that the potatoes did NOT cook in time given in the recipe. I didn’t realize they would still be so firm when the fish finished cooking. I cooked everything a little longer, but, the fish ended up falling apart so it was more flaky than chunky and the potatoes were still firm. Next time, I will cook the potatoes separately until they are almost done and add them to the pot at the same time as the fish to allow them to absorb some of the flavors. 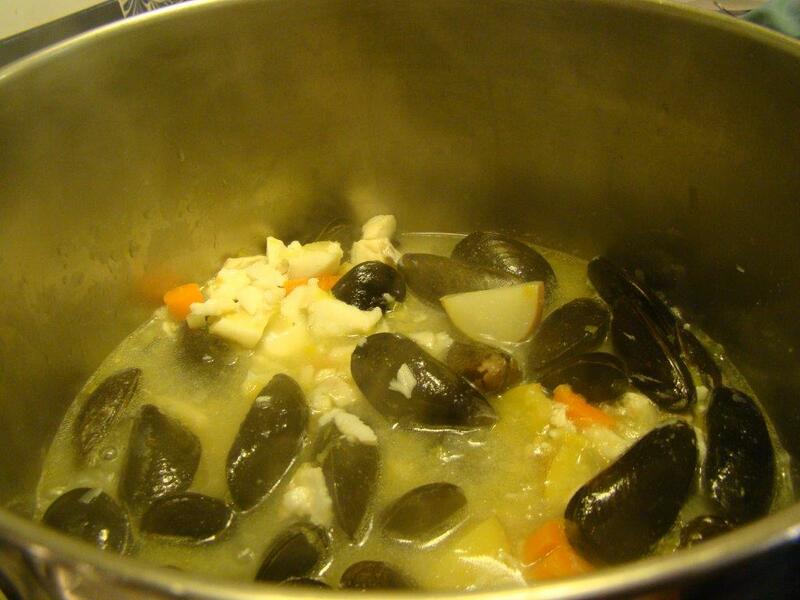 This simplest fish soup makes a wonderful meal. Everyone enjoyed it. It works well for company, but it’s easy enough (especially now that I’ve stashed extra fish stock in the freezer) to make on a weeknight. The leftovers are still fine a few days later. I do recommend removing the mussel meat from the shells and discarding the shells before storing. Our New Year’s Eve dinner ended on a sweet note with Howard’s signature dessert, Pots de Crème. The rich chocolate pudding was just the right touch. I also brought out some leftover holiday treats, Karen’s Cracker Candy and Kathy’s Sea Salt Caramel Biscotti (made by Cass), so friends from both near and far ended up sharing our table as we welcomed the new year. 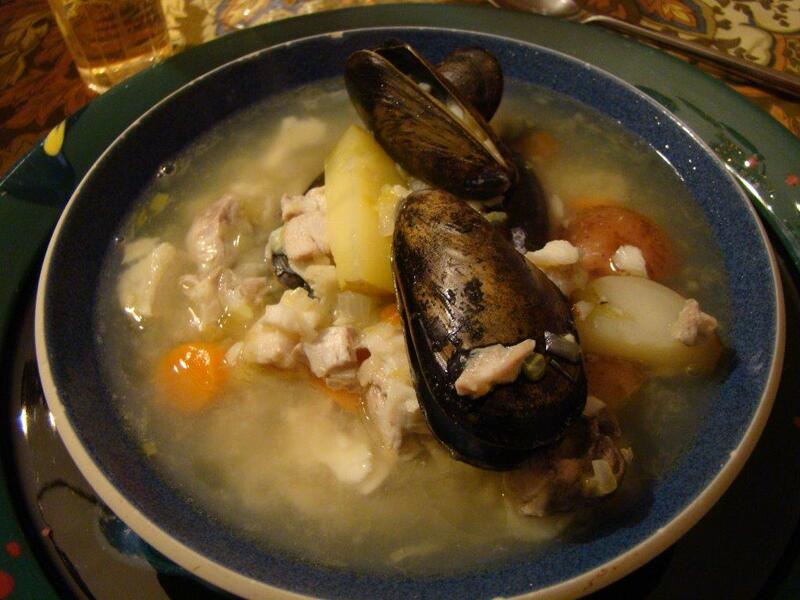 To read about my Dorista friends’ fish soups, check out their links here. You can find the recipe in Dorie Greenspan’s book Around My French Table or on-line at Google books. It’s hard to believe that in just a few more months, we’ll have finished cooking all the recipes in Around My French Table. What a wonderful journey it’s been. I know that many of the friendships I’ve formed over the past several years will be lasting ones. In the upcoming months, we’ll be figuring out another project to keep us cooking together beyond the end of this book. I wish you all a Happy, Healthy, and Delicious New Year! Posted on 2 January 2015, in Fish, French Fridays with Dorie, Soup and tagged fish, French Fridays with Dorie, holidays, soup. Bookmark the permalink. 18 Comments. As a known pac-rat, I get a little mocking from time to time from my daughter, who is a minimalist! She is always telling me “it’s time to get rid of some of this stuff you save”! And I’ve been trying! That’s the plan for 2015!! I really enjoyed your post Betsy! It sounds like you had a perfect NYE! We loved this soup! I boiled my potatoes longer than Dorie suggested, because when I tested them they were quite hard. I also threw in some carrots. This one is a keeper! Yours looks perfectly wonderful!! Happy New Year!! Sounds like a true Yankee New Year year… glad to hear about someone else who doesn’t shy away from fish. I am not a pack-rat but I live with a husband who thinks he’s not, but is… at least he clean out the garage and I can park my car in it this winter. Of course this year, it still has only snowed once. Happy New Year dear! Sounds like you had a lovely holiday. We’ve only been in this house eight years, but I have boxes that have been through three moves…This past year, I finally bit the bullet and went through them. It was pretty liberating. I am impressed that you made your own fish stock – great thinking to ask for the left over bones. Happy New Year Betsy! I didn’t even make the vinaigrette but enjoyed the soup. I am a bit of a packrat too and need to downsize possessions after almost 5 years in the same space. Any tips appreciated, and good luck with fulfilling your resolution. We’ve been here almost nine years and it’s definitely time to get rid of the excess. I love that you msde toyr own fish stock for this one. I’m looking forward to trying it sometime soon. Happy New Year, Betsy. Let’s talk about getting rid of excess baggage – I’m a Master, having gone from a crammed (well-decorated, however) very big house to 940 square feet. The thing is, it’s difficult, at the beginning but, after 6 or 7 hours, it gets very, very easy. I spent some of the holiday season ridding myself of more stuff. On to your soup. Thank you for being so thorough in your explanation. As we speak, I am staying in Cedar City, Utah, tonight, on my way to Cambria. I saved this soup until I’m on the coast and can get fresh fish. My next post. I actually am happy about all the fish recipes coming up. Congratulations on the fish stock. I, for one, know that homemade stock cannot be beaten. Yea to Howard for the dessert. Happy New Year! Sounds like you and Howard enjoyed a lovely celebration to ring in the new year. I was equally confused about how I was supposed to serve this dish, and even after reading and re-reading the directions about a dozen times, I’m still not certain that I got it right. Either way, I agree with you that the vinaigrette was an odd addition. Kudos on making your own fish stock. Did you happen to use that stock to make the aspic and caviar recipe? I was thinking about doing that myself since I’m not sure I’ll find fish bouillon around here. Happy New Year, Rose! Yes, I did use the stock for the aspic. I couldn’t fish bouillon cubes anywhere, and I tried multiple stores. I substituted fish stock for the water and just skipped the cube. Good luck! Happy New Years Betsy, kudos to you for making your own stock. What a great post! I’m so glad there are plans to continue cooking together after AMFT wraps up. Thanks also for your Christmas card–I would love to meet if you’re ever in Maryland and have extra time….Your New Year’s menu sounds so festive and fun! 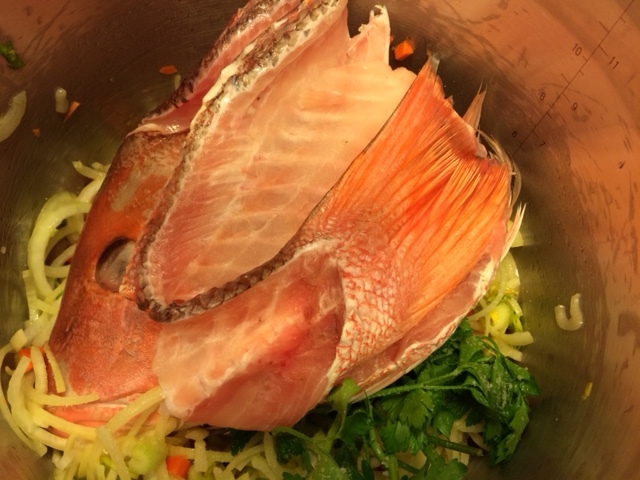 I made my own fish stock once and was amazed by how much better it is than store bought. I appreciate the reminder about it. Thanks also for recommending the Cook’s Illustrated pot de creme recipe. I’m going to look for it. My husband did not like the vinaigrette on the soup either. I cut my potatoes small and thin and they cooked perfectly. Kudos to you for making your own fish stock. I think the gelatinous mass would scare me. Happy New Year and good luck with the clean out. Happy New Year! Sounds like a wonderful way to ring it in! Happy New Year! What a wonderful evening you had! I didn’t trust the timing of the potatoes (luckily), so everything actually came together. This was a hit, though I really liked the drizzle of vinaigrette. I don’t know that I’ll make any (my freezer is small), but the stock tips are good. Who knew you could get the bones at WF? It’s hard to minimalize when you might need something someday. Sous Chef thinks I’m a pack-rat too, but hey, every time I get rid of something I find myself needing that item and repurchasing it. We loved this soup, it was the first meal I made for Sous Chef when he came home from the hospital.